ADINA TMC is a comprehensive program for solving fully coupled thermo-mechanical problems. ADINA TMC offers a reliable and robust approach to challenging problems, such as frictional heating, heat transfer between contacting bodies, heat generation due to viscoelastic or plastic dissipation, and thermal deformations. ADINA TMC is used to solve coupled thermo-mechanical problems in solids and structures, and fluid-structure interactions. The program can handle fully coupled problems where the thermal solution affects the structural solution and the structural solution also affects the thermal solution. As well, ADINA TMC can handle one-way coupling where only one of the two physics fields affects the other. The first example involves the coupled analysis of brake systems. These can be strongly coupled problems with heat transfer due to contact between the disk/rotor and the pads, extensive heat generation caused by friction, temperature-dependent mechanical and thermal properties (the brake components experience a considerable temperature change during braking). For more details, see the ADINA News on Thermo-Mechanical Coupled Analysis of an Automotive Disk Brake. Note that a simpler brake configuration was also presented in another ADINA News. The second example is an exhaust manifold which was reported in the ADINA News of June 15, 2007. This example couples structural, thermal, and fluid fields and requires ADINA FSI to run. 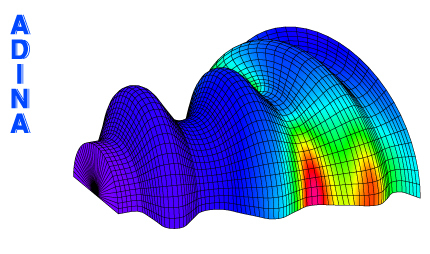 The temperature distribution in the manifold is shown below. The Three-Network material model is used with the 3D-shell element to model a rubber CV-joint boot. This model includes self-contact and temperature effects in a fully-coupled thermomechanical analysis.